In the month since it hit the streets (at least here in the U.S.), I’ve been surprised at how little those who like Cluetrain know about the new, 10th anniversary edition of the book. Many assume that it’s a fancy new edition of the same old thing. That’s true to the degree that it comes with a hard cover and a nice design. But there are also five new chapters by the four original authors, plus three additional chapters: one each by Dan Gillmor, Jake McKee and JP Rangaswami. In other words, it’s a lot thicker and more substantial than the original. So yeah, I’m promoting it a bit. I’ve done approximately none of that, and it deserves any plug it gets. A lot of good work went into it. 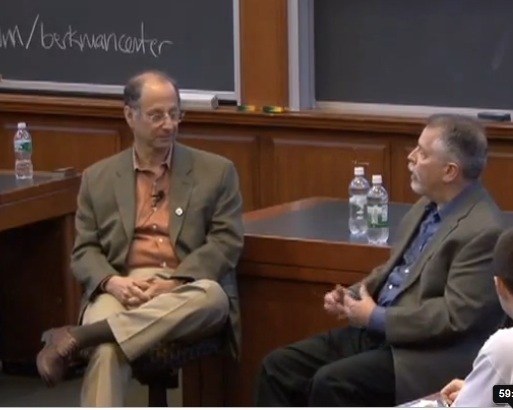 The shot above is from a Berkman YouTube video of a Cluetrain discussion at Harvard Law School, led by Jonathan Zittrain, and featuring Dr. Weinberger and myself. Nice discussion. When was it? Also, the cluetrain.com website is out of commission (at least when I’m writing this it was redirecting to http://www.indra.com/unavailable.html). Dealing with the website now. Thanks for the heads-up. I enjoyed the original Cluetrain in ’99. It was a big influence for me on how to market to college students. I am reading the anniversary edition now and the new chapters are great. They are a good updates to the original ideas. Thanks Doc for your insight on where we need to be going to be good communicators!